With some time to kill Monday, June 15, I stopped by Duluth’s Enger Park just to look around. It’s lovely and, of course, dominated by Enger Tower, offering 360-degree vistas of most of Duluth from a commanding height. I used to play in and around the tower as a child. We lived below it, perhaps a mile away in the West End. It made a wonderful battlement if we were playing “Ivanhoe” or Knights of the Round Table. It had been years since I climbed the several-story tower (I forget how many), so I decided to trudge up its many steps on this visit. At my age, you never know how much longer you’ll be able to do it. At the base of the stairs, I recognized a brass dedication plaque I hadn’t read in a long time, a tribute to Duluth “merchant prince” Bert Enger, who donated the land atop the hill, including the golf course named for him, and the tower and nearby park. I was there on the 70th anniversary of the tower’s dedication. I know a little something about that dedication, having read old newspaper accounts of it (I was born three months later), and, with the help of Wikipedia as a refresher, here are some facts about the occasion. When he came to Duluth in 1939, Crown Prince Olav V was heir to the Norwegian throne. He was accompanied by his wife, Princess Martha. The couple were the parents of Harald, then 2 years old, the current king of Norway known as King Harald V. Harald’s father and Duluth’s guest on that day in 1939 ascended to the throne in 1957 and ruled until his death at age 87 in 1991, after which Harald assumed the crown. Just two-and-a-half months after the royal couple dedicated Enger Tower, World War II broke out in Europe when Germany invaded Poland on Sept. 1. The German occupation of Norway was soon to follow and the royal family had to flee. Crown Prince Olav joined the government in exile in England, but his wife, Princess Martha, and her children -- Harold, the heir apparent, and two daughters -- came to America and for a time resided at the White House as guests of President Roosevelt and his wife, Eleanor. Historian Doris Kearns Goodwin gives a full a account of this in her book, “No Ordinary Time.” There were those who believed that President Roosevelt was enamored of Princess Martha, and all that that implies. Princess Martha died in 1954. 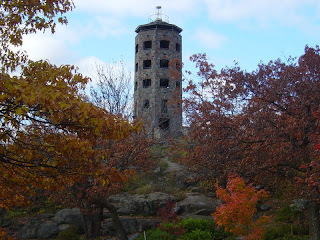 Anyway, Wikipedia bore out what I thought I knew about the dedicators of Enger Tower. The stone tower has withstood a lot of Noreasters in 70 years, and silently presided over much local and national history. As a child, I, too, played around the base of Enger Tower. I loved climbing the stairs to the very top to look out over the vast expanse of water. Thanks for sharing your recollections of this amazing city treasure. And... we'll have Swedish dignitaries returning to Enger in the near future.